SCVHistory.com LW3132 | Film-Arts | Lantern Slide: Kermit Maynard in 'Gun-Hand Garrison,' Trem Carr 1927. Kermit Maynard in "Gun-Hand Garrison"
Magic lantern slide advertising "Gun-Hand Garrison" starring Kermit Maynard (as "Tex" Maynard), Trem Carr Productions 1927. 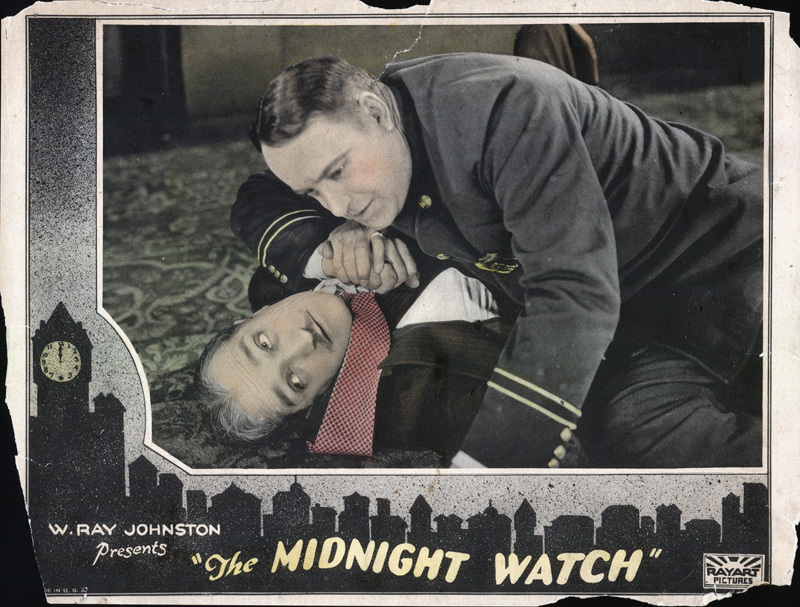 The lantern slide was issued by "National Studios Inc., Formerly Excelsior Illustrating Co. Inc.," patented 1924. Kermit was better known for his stunt work, leaving the acting to brother Ken Maynard. From the porch roof where Kermit is standing in this image, it would not be unusual to see him leap onto the men below, or onto a horse from this height. 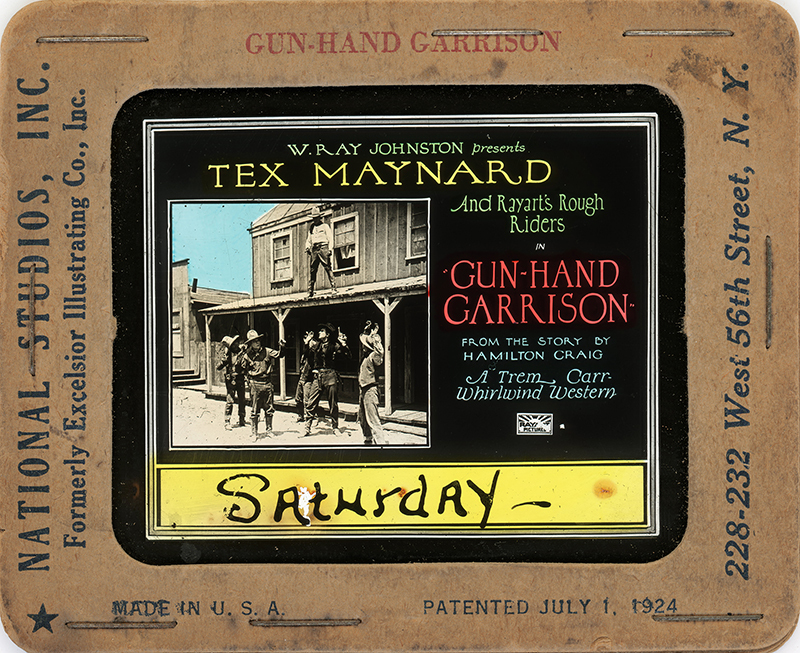 "Gun-Hand Garrison" was distributed by future part-time Newhall resident W. Ray Johnston's RayArt Pictures Corp. and features Rayart's Rough Riders. The cast includes Paul Malvern, who was also directing pictures in Placerita Canyon in the 1920s. The term "Rough Riders" suggests it's a buddy picture — a formula Malvern would champion in the 1940s when he recycled waning "B" Western stars of the 1920s and 1930s by teaming them up together (usually three of them) in the same feature. Rounding out the cast are Ruby Blaine, Jack Anthony, Charles O'Malley, Charles Schaeffer, Edward Heim and A.E. Witting. The crew includes a few of Carr's regulars: Edward Gordon (director), Arthur Hoerl (screenplay) and Hap Depew (cinematographer). LW3132: 9600 dpi jpeg from original lantern slide purchased 2016 by Leon Worden.